"The Winecoff Hotel is on fire!" Twenty minutes later the fourth, final and "general alarm" - the one reserved for a citywide conflagration - went out. For the next two hours everything good, bad, improbable and certain about the human experience played out. Few events in history can match the Winecoff Fire for extremes. No one who was there has ever been the same since. Every witness was affected for the rest of their lives. The shock waves affected thousands more and still ripple today. The tragic fire was at first ruled an accident in headlines welcomed by the public and embraced by city officials. But soon, closer examinations revealed an act so violent, so vicious - yet so unthinkable - it plunged the city into a state of denial from which it has never fully recovered. Many shattered lives were bravely pieced back together. Many grew stronger, most suffered mightily and some are still struggling. 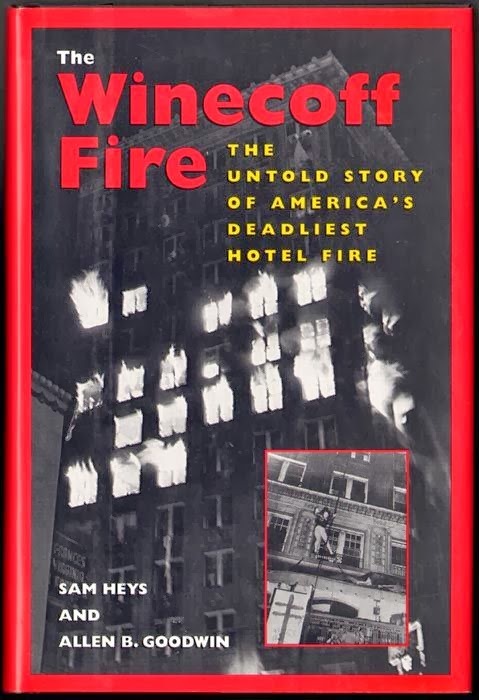 The Winecoff Fire: The Untold Story of America's Deadliest Hotel Fire --the tragedies, the triumphs, the extremes. All students of the Winecoff fire are urged to pick up a copy of the Atlanta Journal & Constitution from Monday December 4th to see a fantastic front page story on the remembrance ceremony & reception hosted by the Atlanta Fire Department. In this front page photo are former Atlanta firefighter Rick Roberts and Connie Foster, the woman he rescued as an infant. They are bracketed by George Goodwin (left) and Aubery Morris (right), two newspaper men who covered the fire.